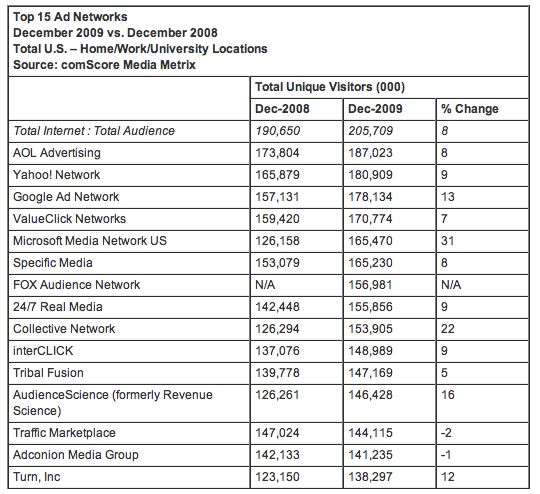 comScore has released its December 2009 rankings of the Top Ad Networks by reach of US internet users. AOL continued to reach the largest percentage of internet users reaching 186 million people or 91% of the total internet audience followed by Yahoo! Network (180.9 million) and Google Ad Network (178.1 million). Although reach has been equated with advertising value to brand advertisers, advertising reach clearly doesn’t translate into earnings power or stock market value for either AOL or Yahoo. Combined the two companies ad network’s reach victories produce stock market valuations of $2.71 and $23.99 Billion respectively. Combined AOL and Yahoo’s market values are 14% of Google’s $187 Billion market capitalization. Buying reach online may be valuable to brand advertisers, but it apparently isn’t as valuable as buying search is to all the small to medium size non-brand businesses who advertise on Google. 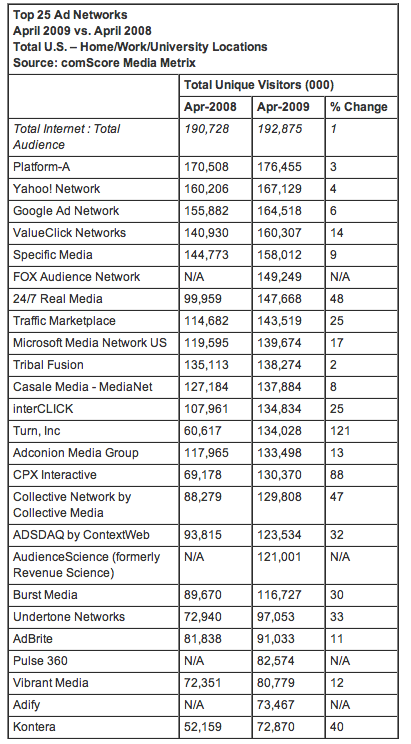 comScore has released their list of the top 25 Online Advertising Networks based on their reach among U.S. Internet users in April 2009. 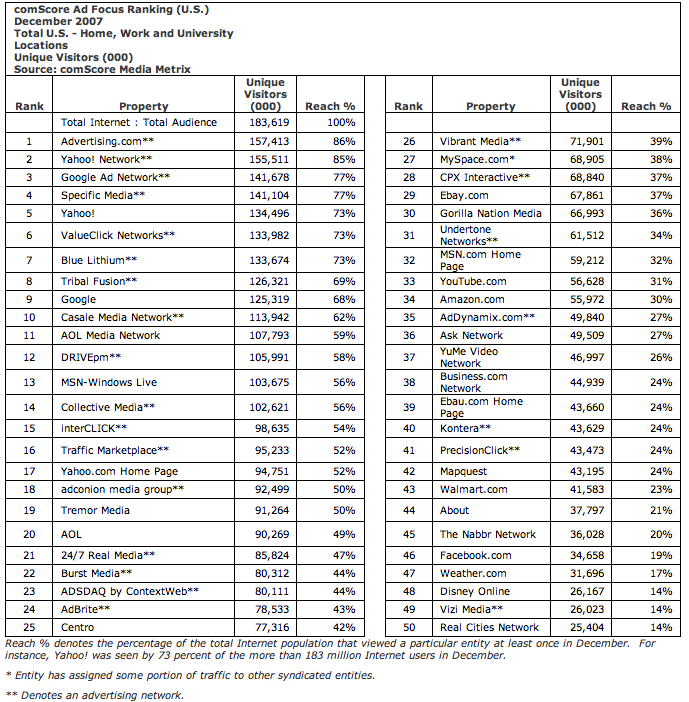 The top five online ad networks are AOL’s Platform-A , Yahoo! Network , Google Ad Network, ValueClick Networks and Specific Media. The sixth largest network is the new Fox Ad Network. With the exception of Rupert Murdoch’s News Corp and Yahoo Ad Network’s joint venture with publishers. it appears the newspaper industry as a whole has missed possibly the only opportunity left remaining to extend its reach and audience targeting potential through ownership in or control of an online advertising network. I guess that’s why Rupert Murdoch is Rupert Murdoch. The Wall Street Journal reports online ad networks are experiencing contractions in advertiser spending amid this economic cycle’s deceleration. The Journal also suggests the decade old online ad network industry and its 300+ web ad brokers are in the process of experiencing a contraction in their numbers as well. In this industry’s contraction, will the reduction in the 300+ online ad networks reduce the overall supply of online ad availability to ad buyers? Or will the industry’s excess ad supply end up being provided for out of its surviving web ad brokers inventory? My guess is no one but those who once worked for the soon to be shuttered web ad brokers will notice they have stop supplying ads.